While the United States might have California, Oregon, and Washington as its west coast playgrounds, there’s one spot north of the border where Canada plays in the Pacific Ocean, British Columbia. The roughly 600 miles of coastline and inland areas play host to beautiful sights, flora, and fauna and some of the most beautiful Provincial and National Parks in North America. Let’s get more in-depth in British Columbia by exploring their best five RV parks, grounds, and sites. Get a head start on experiencing the Pacific Province below known for its seafood, the bustling Vancouver, and some of the most beautiful mountains in all North America with our guide to where to stay below. With a name like Living Forest Oceanside RV Park and Campground, you know that this RV park will be especially welcoming to those nature and all its splendor. At over 50 acres, you won’t have to worry too much about being too close to your neighbors. Nearby Nanaimo Harbour hosts Newcastle Island Provincial Marine Park which boasts beaches, a lake, miles of trails, and other fun activities for the whole family. There is plenty of relaxation and fun to be had at Nanaimo Harbor itself which hosts parks and shops. Neck Point gives you relaxing views of The Georgia Strait. Other popular nearby attractions include Cathedral Grove, Little Qualicum Falls, and Linley Valley. Lamplighter Campground is your entry point to all the wilderness fun and sights around the Revelstoke area. The park itself has all the essential amenities that an RVer could ask for including large pull-through sites with full utility hookups and fire pits. The bathrooms, showers, and laundry facilities are clean, bright, and welcoming for you to clean off the day’s journey. Lamplighter rounds up its facilities with a camp kitchen, horseshoes, volleyball courts, free Wi-Fi access, and hiking and biking trails coming straight from the campground. One of the more significant draws of staying at Lamplighter Campground comes with its proximity to Mount Revelstoke National Park. The Meadows in the Sky Parkway up to Revelstoke can only accommodate single axle vehicles, which excludes trailers of all kinds. Trailers would need to be dropped off at the Nels Nelsen historic area; if taking an RV, the maximum length to travel up the parkway is about 33 feet and must be a single axle. The National Park itself is a rainforest that hosts a wide variety of wildlife and plant life. The most popularity at Mount Revelstoke remains to hike the several miles of mountain trails. 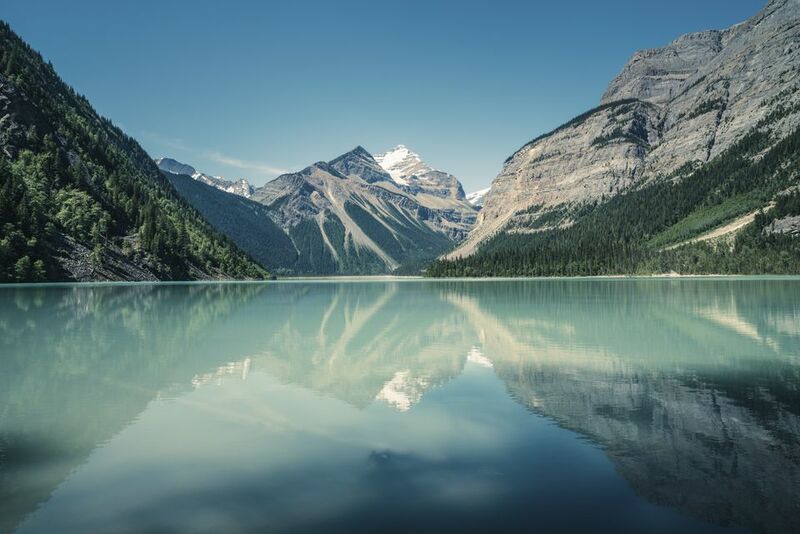 Other activities nearby include whitewater rafting, the Skytrek Adventure Park, skiing, snowboarding and if you want to get back into the states, you can explore nearby Glacier National Park. Northern Lights RV Park has undergone many renovations over the past few years, establishing it as one of BC’s best RV parks. 92 full-service sites, both pull-through and back-in, come loaded with full utility hookups with both 30 and 50-amp electrical hookups, water, and sewer, along with cable TV and Wi-Fi access. The laundry and bath facilities are all new, clean and inviting, Northern Lights even hosts private washrooms if you don’t feel like sharing your amenities. A small camp store provides a few supplies that will help get you through your trip without making a long drive. There are two nearby experiences for outdoors types, Kiskatinaw Provincial Park, and Kinuseo Falls. Kiskatinaw provides areas for magnificent views as well as areas to view the landmark Kiskatinaw Bridge while Kinuseo Falls gives visitors some of the best hiking in the area along with some on-the-river fun. The Northern Alberta Railway Park hosts “Mile 0” of the Alaska Highway, and the Walter Wright hosts what Dawson Creek was like before construction began on the Alaskan Highway. There are all types of adventures for all types of travelers at Dawson Creek and Northern Lights RV Parks. Wild Rose RV Park boasts that you can camp under the trees or the stars. Both seem like great options at this popular and well-rated BC RV park. The park is right off the interstate for easy access and has many features and accommodations that an RVer would expect from a highly-rated park. Sites come with full-service utility hookups including both 30 and 50-amp options and free cable TV. Pull-through sites reach up to 65’ so there is plenty of room for even the biggest of rigs. There are plenty of clean facilities to wash up including free hot shower facilities, bathrooms, and a laundromat. Wild Rose rounds out its amenities with a community center, dump station, camp store, and free Wi-Fi access. The town of Hope, BC is loaded with fun and adventure. One of the most popular activities in Hope is the Othello Tunnels within Coquihalla Canyon Provincial Park. The tunnels once made up a railway but have been repurposed as hiking trails that lead out to Coquihalla Pass. Hell’s Gate is a section of the Columbia River that narrows and makes for some great whitewater and the favorite way to see Hell’s Gate is on the Airtram. Other fun activities in Hope include Falls Lake, Hope Golf Club, and the Hope Slide. Mountain Shadow RV Park calls itself “A Slice of Heaven in the Wilderness,” and after looking over their facilities and area activities, we agree. The park is outfitted with both large back-in and pull through sites, and each of these sites comes with electric and water hookups, there are no sewer sites, but the park contains a dump station where you can dispose of your dirty business. Most sites come with a picnic table, and the park provides free firewood for campfires. Mountain Shadow also hosts hot showers and clean bathrooms. Iskut and the Iskut Valley are known as the Resort Capital of Northwest BC and are full of adventure and fun. Nearby you’ll find Spatsizi Plateau Wilderness Provincial Park, one the larger Provincial Parks in Canada and one of the most secluded. In fact, your only way into Spatsizi is on foot, horseback, canoe, or plane! If you want to just relax, you can find some excellent fly-fishing spots and guides in Iskut. If you want something in the middle, Kinaskan Lake Provincial Park is a good middle ground of established and wilderness. If you’ve seen and done the United States west coast and are ready for something different, give British Columbia a try! The wilderness area and major cities along with some great RV parks make this province an excellent destination.